Boerhavia triquetra S. Watson var. intermedia (M.E. Jones) Spellenb. Habit: Annual. Stem: ascending or erect, 2--5 dm; hairs fine, sparse. Leaf: blade broadly lanceolate or ovate, acute to obtuse. Inflorescence: generally umbel of 3--6(8) flowers or flowers 1 or paired. Flower: 1.5--2 mm; perianth pale pink to white. Fruit: 2--2.7 mm, glabrous, length 3 × width; ribs (3)5, rounded to angled; tip +- truncate to abruptly rounded. Ecology: Gravelly washes, flats; Elevation: < 1300 m. Bioregional Distribution: e PR, e DMtns (Ivanpah Mtns, Clark Mtn, Kingston ranges), se DMoj exc DMtns, e DSon; Distribution Outside California: to Texas, Mexico. Flowering Time: Aug--Oct Note: In northern Mexico, less so in California, intergrading with Boerhavia triquetra S. Watson var. triquetra of Mexico; easily confused with Boerhavia erecta L. (fruit 3--4.5 mm), widespread in tropical America, expected as agricultural weed in California near Mexico. Unabridged Note: In northern Mexico, less so in California, poorly distinguished from, intergrading with B. triquetra S. Watson var. 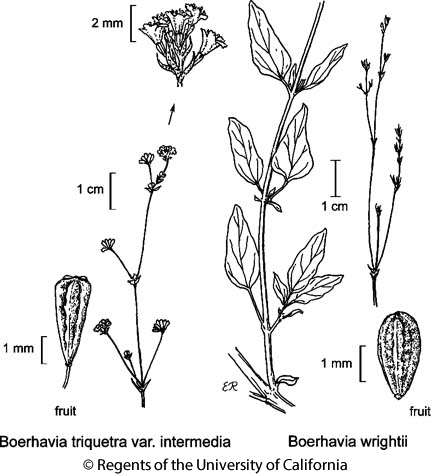 triquetra of Mexico (flowers generally 1 or paired; fruit length 2 × width, ribs 3, rarely 4, sharp, tip truncate); easily confused with Boerhavia erecta L. (fruit 3--4.5 mm), widespread in tropical America, expected as agricultural weed in California near Mexico. Citation for this treatment: Andy Murdock 2012, Boerhavia triquetra var. intermedia, in Jepson Flora Project (eds.) Jepson eFlora, http://ucjeps.berkeley.edu/eflora/eflora_display.php?tid=85884, accessed on April 26, 2019.
e PR, e DMtns (Ivanpah Mtns, Clark Mtn, Kingston ranges), se DMoj exc DMtns, e DSon; Markers link to CCH specimen records. Yellow markers indicate records that may provide evidence for eFlora range revision or may have georeferencing or identification issues. Purple markers indicate specimens collected from a garden, greenhouse, or other non-wild location.